The miracle of life is a blessing that all families should celebrate. But treacherous roads, long distances and high costs of health care all contribute to the risks of giving birth. For many parents in Burkina Faso, the challenges of receiving medical care are huge. With a lack of facilities many women opt for a home birth but with no assistance from medical professionals and often unsanitary conditions; home births are one of the leading causes of child mortality and women dying from postnatal complications in Burkina Faso. To address this challenge, International Needs built a health centre in 2009. Since then this facility has supported thousands of individuals with healthcare. In 2017 it received over 27,000 attendees. 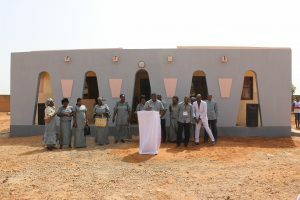 Following rapidly increasing demand for maternity services, in 2015, we began a project to build a new seven-bed maternity ward to offer maternity care for families in Bobo Dioulasso. With the help of our generous supporters, we were able to raise over £100,000 to build and equip a new maternity centre. The new maternity unit officially opened in February 2017, and as of November 2018 it has provided over 11,000 attendees with maternity care and over 1,200 babies have been delivered. Aminta and her baby boy. Aminta was one of the first women to give birth at the maternity unit opened by International Needs in Burkina Faso in 2017. 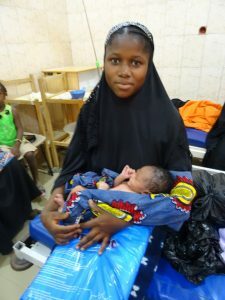 Aminta surprised staff at the maternity centre as she arrived alone on a motorbike, unsure whether she was in labour. When she was attended to, staff found that she was already in established labour and she delivered a healthy baby boy just two hours later. By supporting our Health Projects you ensure that the maternity centre can continue to provide valuable care to the communities of Bobo Dioulasso. Funding goes toward supporting training for medical staff, providing medical equipment, medicine and supporting the medical centres to become increasingly self-sufficient. In 2017 a generous donor supported the medical and maternity units to install new solar panels. This has dramatically reduced electricity costs by 75% meaning the centre can now invest in more equipment and medicines for treating patients. If you would like to support projects like this, why not join the International Needs Family and support our health projects? Our Health Centre in 2016 had 3,561 visits that were maternity related. 1,268 for other disease such as typhoid fever, UTIs etc.